Hyde Bar and Gin Parlour is the perfect venue to celebrate any special occasion – we take bookings for group dinner and lunch both big and small. We are located less than 5 minutes from Eyre Square in the heart of Galway city. Our venue offers a number of different dining options depending on your needs. If it’s a birthday, an anniversary, celebratory lunch or just a night out with friends join us for a great meal in Hyde. We take group bookings for lunch or dinner both large and small. Whether you are after something simple, or something spectacular, we work with you to design a set menu for your group. Talk to us today and let’s begin planning your celebration. Sharing Platters now available with a selection of Nachos, Chicken Wings & Bruschetta. Ideal for 4 – 6 people. €27.50 per platter. Bookings & Enquiries, please call us on T:091 564111 or click the button below. 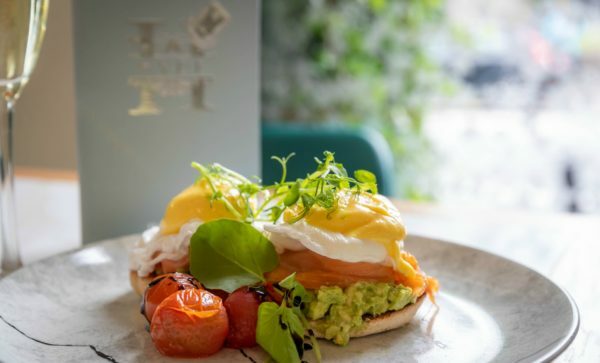 Take brunch to the next level an enjoy a Mimosa, with your choice of American Style Pancakes, Hyde Quiche Tartlet, French Toast, Avocado & Caprese Wrap or Veggie Nachos. Brunch is served from 11am until 5pm each Friday, Saturday and Sunday. Package created on request to suit all budgets and tastes. Booking in advance is essential. Ladies what Brunch…… with bubbles!! Why not Be the Goddess you know you were born to be!!!! Why not try your hand at some flower crown making? With this fun, bohemian inspired, eco conscious workshop, you and your friends will design and create your very own flower crowns. Learn a new craft, hit the town and cause a stir with your floral headpieces. Choose Two cocktails which represent the two sides of your personality: A Dr. Jekyll Cocktail & A Mr. Hyde Cocktail | Served with delicious sharing boards | €25.00 per person | Minimum Booking for Groups of 6 guests or more. Booking in advance is essential & Subject to availability. Gin Tasting consists of a tutorial on 3 of our premium gins. A 15ml tasting of each of some of the worlds most popular & unique gins. Served with a Premium Tonic | €20 per person | Minimum of 2 guests | Add in a sharing board for €2 per person (when booked in groups of 6 or more) | Booking in advance is essential & Subject to availability.